The Black Heritage Review presents an a special edition of the Black College Sports Encyclopedia - The Shaw Bears - The Decade of Champions and Beyond. Updated through the 2011-2012 athletic season! Since 1999 Shaw University has experienced the greatest era in her athletic history. There was a shift in the balance in the CIAA as university leadership brought a new attitude to the program. The Shaw Nation is now one of the strongest programs in the country. It is no longer acceptable to just compete, it is now about winning championships. AND, the Bears and Lady Bears have won more championships since 2000 than they had over their previous history. 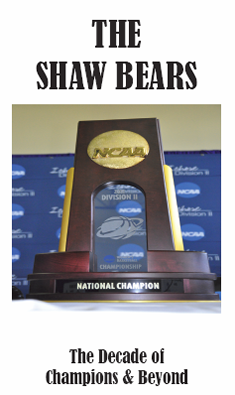 Get to know more about Shaw athletics and the championships they have been won over the years. Get to know the coaches and athletes who won those championships. - $30.00 + shipping and handling.